Charlotte Monro is a well-respected, longstanding staff member and trade union representative at Whipps Cross Hospital. In 2009 Charlotte received a special award from the Trust for her tireless efforts to defend services. The new Barts Health Trust has now dismissed her because she continued to do so! Hundreds of staff are being down-graded and services across East London are being cut. As Unison Branch Chair, Charlotte raised concerns of staff over the impact of cuts on patient care with Waltham Forest Health Scrutiny Committee, and discussed the cuts with her union members. For this she has been sacked! This is an attack on the right to speak out in the NHS, and on the rights of health staff to organise in trade unions and to campaign for services. We believe a climate of silencing staff through intimidation has no place in a caring service. 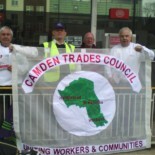 This entry was posted on December 3, 2013 by CAMDEN TRADES COUNCIL.